Is Exo a social enterprise? Absolutely! Exo is a social venture in the most fundamental way. Our primary goal is to change the way people think about an untapped food source. If we’re successful (and we think we will be), it will have an enormous positive impact on the world -- and who doesn’t want that? You talk about addressing global food and sustainability problems on a large scale. Why start with protein bars? We believe delicious and healthy protein bars are the first step towards normalizing the consumption of insects, which will, in turn, have an enormous global impact. Much like the California Roll first introduced Westerners to sushi in the 1960s by combining the raw fish with avocado, rice and seaweed, our bars can be an introductory vehicle for insects by combining cricket flour with more familiar ingredients like nut butters and fruits (the sashimi comes later). Where can I watch your Kickstarter campaign video? All our crickets come from our very own food-grade facility that was designed to farm for human consumption. Our crickets eat a Certified-Organic, grain-based diet and filtered water. Check out this video to see more! How do you make cricket flour? After cleaning the crickets, we dry them to remove the moisture and mill them into a fine flour. The result is slightly nutty-tasting flour that is high in protein and micro-nutrients. 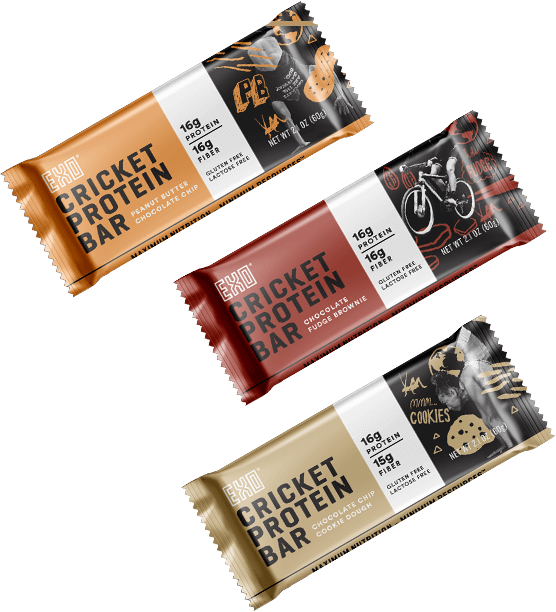 How many crickets are in each bar? There are approximately 40 crickets in each bar. According to some interpretations of Leviticus, crickets, grasshoppers, locusts, and katydids are indeed kosher, as they have jointed legs and hop on the ground. However, there’s no consensus regarding which type of cricket was being referred to, so we have been unable to receive official kosher certification (so far). Technically, no (crickets are animals, after all). But depending on your motivations for being vegan or vegetarian, you might be willing to eat insects. Raising crickets is dramatically less harmful than raising traditional livestock, and invertebrates like crickets have a much less developed nervous system than other animals, with many entomologists believing that they don't even feel pain. Renowned ethicist Peter Singer has expressed that he has no problem with killing insects. How do your bars compare to other bars? We started Exo to create a range of bars that taste great and are actually good for you. And you know what? We believe we’ve succeeded! We use whole, minimally processed, and pronounceable ingredients. Our recipes are developed by amazing chefs who have worked in Michelin-star restaurants. The result is a bar that’s high in protein, low in sugar, and nutritionally dense -- perfect for snacking, meal-replacement, or pre/post-exercise. Our Cocoa Nut, Blueberry Vanilla, and Banana Bread flavors are Paleo. What is the shelf-life of your bars? Because we use only ultra-premium ingredients and zero preservatives, the shelf life of our bars is 10 months. What’s the deal with shellfish allergens? Crickets and crustacean shellfish (shrimp, crab, lobster, etc) are all arthropods. While they are distant relatives, the proteins in their body could be similar enough to elicit an allergic reaction in some people who are allergic to shellfish. We accept all major credit cards and PayPal. If you’re paying with PayPal, after reviewing all of the purchase details, click Complete Order and you will be redirected to PayPal to confirm your billing information. Sign into your account and navigate to the MY ACCOUNT page (top-right corner - LOGIN). Select View Addresses under your current saved address. From here, you can edit or delete your saved addresses, and change the default one too. Sign into your account and navigate to the MY ACCOUNT page (top-right corner - LOGIN). Under Fulfillment Status, you can find the status of your order. If the status is Unfulfilled, it means we’re still working on it. If the status is Fulfilled, it means it’s on the way! For more details, click on the order number. And remember: once your order has been fulfilled, we cannot change or cancel it in any way. We’ll automatically send you a confirmation when your order has shipped - in this email, you can find a link to the tracking information. Or you can visit the MY ACCOUNT page (top-right corner - LOGIN). Under Order History, click on the order number you want to track. You can find the tracking information here. As all of our products are food (i.e. perishable), we do not offer returns at this time. However, if you are unsatisfied with your Exo Protein bars, please contact us at info@exoprotein.com. We’d love to hear your feedback. Simply send us an email at info@exoprotein.com and we’ll make the update for you. Be sure to include the old and the new email addresses! Email info@exoprotein.com and we’ll send you an email with instructions to reset your password. Where do the bars ship from? Your Exo bars ship from our warehouse in New York and your swag orders ship from Printful’s warehouse in California. What if I need my order by tomorrow? Unfortunately, we do not offer an overnight option. However, we do offer two-day expedited shipping to the continental US. For orders placed before 12 pm EST Monday to Friday, the order will ship on the same business day and arrive two business days later. For orders placed after 12 pm EST Monday-Friday, weekends (anytime) or holidays (anytime), your order will ship the next business day and will arrive two business days later. Select “UPS Second Day Air” as your shipping method at checkout to take advantage! When will my Swag ship? We've partnered with Printful to offer you the best custom Exo swag. Your swag will be made-to-order! It takes 2-7 business days to produce your swag in addition to standard shipping transit time (an additional 3-8 business days). Because of this, all swag will be shipped separately from your Exo bars. You don't have to pay for shipping twice, but swag shipping cannot be expedited. Do you ship to APO, FPO or PO boxes? Yes! Select Standard shipping or Priority Mail at checkout. Yes! We ship almost everywhere around the world. Read the Shipping Options section for more details. We do not include duties or tariffs/extra taxes in our prices at this time. Free Shipping offers apply to orders within the continental United States (excluding Alaska and Hawaii), APO/FPO. Unfortunately, Alaska, Hawaii, Puerto Rico, other U.S. Territories, Protectorates and international orders are exempt. Free shipping applies only to orders above $45. Can I ship parts of my order to different addresses? With multiple shipping methods? Unfortunately, we do not offer this option. You will need to place separate orders if you wish to ship items to multiple addresses or use multiple shipping methods. After my order has shipped, how do I edit the shipping information, delivery speed or cancel the order? Unfortunately, once your order has been fulfilled we cannot change or cancel it in any way. Please contact info@exoprotein.com if you know your order is headed to the wrong address! What are my shipping options and when will my order ship? To ensure that your packages are shipped in the most efficient manner, we use several carriers to ship our products. We consider the weight of the packages and their destination when selecting the best carrier to use. Generally, they will ship within 1 business day, and take 3-5 days to arrive. Excludes weekends and holidays. If a business day is a holiday, the order will ship the next non-holiday business day. USPS is the exclusive carrier for this option. We offer subscriptions to any of our 12-bar boxes. With our subscriptions, you can get the bars delivered every 30, 60 or 90 days, hassle-free, and you'll save 11% and get free shipping. We also put aside inventory every month for our subscribers, so you'll never have to worry about out-of-stock delays. Here’s your guide to managing your subscriptions…. Ships To: Click here to edit your shipping information. Each of your subscriptions can have a different shipping address. If you move, please make sure you update all of them! Change next shipment date. Going away and need to delay your delivery? Roommate ate your bars and you need to expedite your delivery? No problem. Customize your next delivery date here. Cancel: Click here to cancel your subscription. Re-activate: Click here to reactivate a previously canceled subscription. Add Product: Click here to add a product to your subscription. You’ll be given the option to select a product, the frequency of deliveries, quantity and next shipment date. Delivery Schedule: Click here if you’d like to review your next few shipments. From here you can edit or skip shipments. Only your next few shipments will appear here and more shipments will appear as the dates get closer. Billing Information: Click here to review or edit your billing address and credit card. Purchase History: Click here to review your purchase history. Don’t panic! You won’t miss a shipment. If your payment was declined, we’ll send you an email with a link where you can update your account. Or, you can head to the Billing Information page in the Manage Subscriptions section of your account. Once you’ve updated your credit card, we’ll automatically retry to place your order. Will you let me know when I have a shipment coming up? Yes! We’ll send you an email directly before each shipment. You can review your upcoming deliveries at any time by navigating to the Delivery Schedule page in the Manage Subscriptions section of your account. Since you’re storing my payment information - how do I know it’s safe?